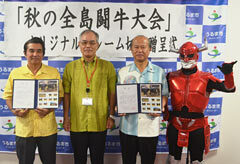 At the Uruma City Office on October 23, Uruma City Mayor Toshio Shimabukuro (third from left) and Masakazu Kochi (far left), the chairman of the Okinawa Prefectural Bullfighting Federation, receive the commemorative bullfighting postage stamps from Akio Higa (second from left), the postmaster of Ishikawa Post Office, and bullfighting warrior character Waido (far right). On October 23, the Okinawa branch of Japan Post released postage stamps commemorating the 100th All Okinawa Bullfighting Tournament. The stamps depict bullfighting scenes mainly from the works of freelance photographer Yukie Kudaka, who is from Uruma City and has published a photo book entitled “The Bullfighting Woman.” One sheet contains ten 80-yen stamps and a total of only 1,000 sheets are available in post offices in Uruma, Okinawa, Kin, Onna and Ginoza. On October 23 at the Uruma Municipal Office, Akio Higa, the postmaster at the Ishikawa Post Office, presented the commemorative postage stamps to Uruma City Mayor Toshio Shimabukuro and Masakazu Kochi, the chairman of the Okinawa Prefectural Bullfighting Federation. 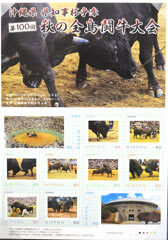 They reminisced about popular bulls such as “Yukari-go” that competed during the half-century history of bullfighting. The tournament has now been held 100 times. Postage stamps commemorating the 100th All Okinawa Bullfighting Tournament.